As Thing 5 gets older and is no longer into playing with the baby toys, we are trying to find him more things to play with as he grows up and starts exploring the world through his more grown up toddler eyes. He is 22 months old now and I keep forgetting that he no longer wants the annoying musical repetitive toys but wants to be so more hands on with his toys as he gets older. Whilst on a trip to a local toy shop recently we were summoned straight to the Lego aisle by Thing 4, aged 4.5 years. Whilst he stared open mouthed at how much Lego was on offer I glided down the aisle towards the Duplo sets leaving Thing 4 and Daddy wondering how they could smuggle a Lego Simpsons house set out of the store! Myself and Thing 5 stumbled upon the Lego Duplo Picnic set amongst all the other Duplo sets available. With 52 pieces in the set all contained in a lovely colourful box, we had to have it. The pictures on the front were vibrant and showed us exactly what we could expect from the contents inside. Although we do already have a Duplo brick box set 5506, the picnic set was ideal for a toddler who could see a more defined end product with minimal brick usage to make each model. Our older children are quite happy with a box of bricks and can use their imagination to make whatever they want to but Thing 5 isn't quite there yet. 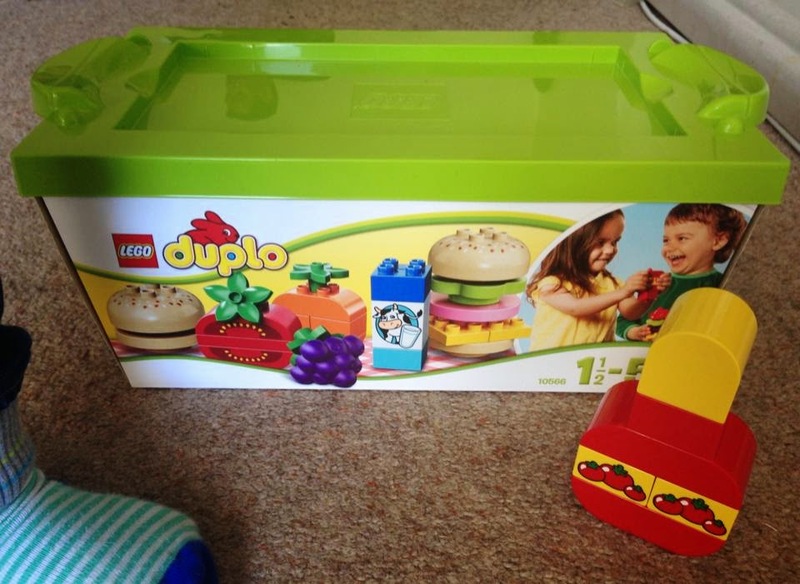 The Duplo Picnic set is aimed at the age range of 1.5 yrs to 5 yrs and was priced at £19.99 from the store we purchased it from, although is available from many store and online retailers. As soon as we got home from the toy shop we opened up the Duplo picnic box and set to work making different things. The first thing had to be a burger with a bottle of ketchup on the side! Thing 5 loved it, he loved the end product and could easily see what was made. With a handy booklet inside that shows you what can be made with the contents inside we were able to make burgers, a carton of milk, some grape jam, a tomato, some grapes, an orange plus other things too. You can even use the lid as a serving tray when your food is ready for a pretend picnic! Some food made from the pieces in the set. Needless to say the set appealed to the older children too and I have eaten many a Duplo burger since our purchase with ample amounts of Duplo ketchup too! This is a fab little set and keeps the children entertained as it opens up a whole new play experience with the role play of picnics and eating with friends too. 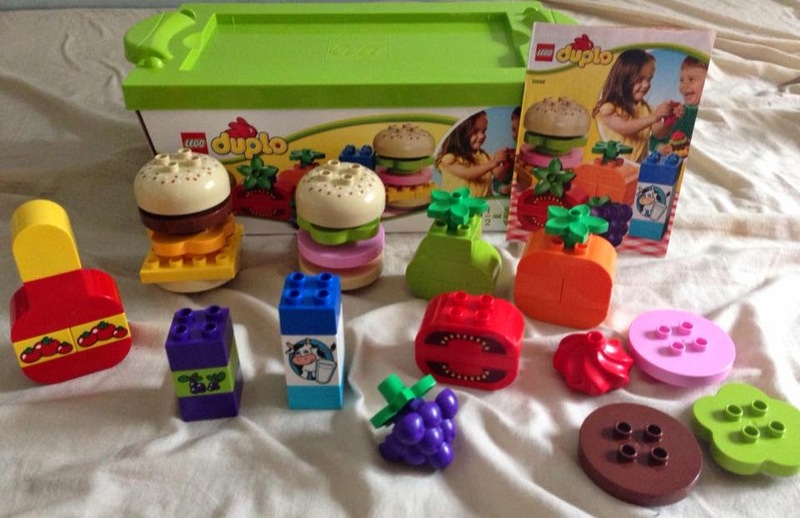 We now have our eye on the Lego Duplo Creative Cakes set 6785 and the Lego Duplo Creative ice cream set 10574 as our next purchases so we can really enjoy a feast at our next picnic! I loved playing with stuff like this when I was younger! I hope they enjoy! We're huge fans of Duplo too - although my eldest is getting more into Lego he's still happy to go back to the Duplo with his little sister.